Jacksonville-based Crowley Holdings Inc., a holding company of the 123-year-old Crowley Maritime Corporation, is a privately held family and employee-owned company. Crowley Maritime Corporation recently set the main engine onto El Coquí, the first of two new, “Commitment Class ConRo” (combination container and Roll/On-Roll/Off) ships that will be powered by liquefied natural gas for use in Jacksonville-to-Puerto Rico ocean cargo trade on 2017, the company announced Tuesday. “This state-of-the-art engine technology will add efficiency while continuing to reduce impacts on the environment, one of Crowley’s top priorities,” said John Hourihan, senior vice president and general manager, Puerto Rico services. “Utilizing this green technology is just another way we are demonstrating our commitment to the people of Puerto Rico, our customers and the environment. It also bears mentioning that neither of these ships, which have been design specifically for the Puerto Rico trade, gets built without the Jones Act — a federal statute that provides for the promotion and maintenance of a strong American merchant marine,” he said. The engine was placed using a series of heavy lifts by 500-ton cranes in the shipyard of VT Halter Marine. “Crowley is making a significant investment in the Puerto Rico trade to provide faster transit times while continuing with the ability to carry and deliver the containers, rolling cargo and refrigerated equipment our customers count on,” said José “Pache” Ayala, Crowley vice president, Puerto Rico. 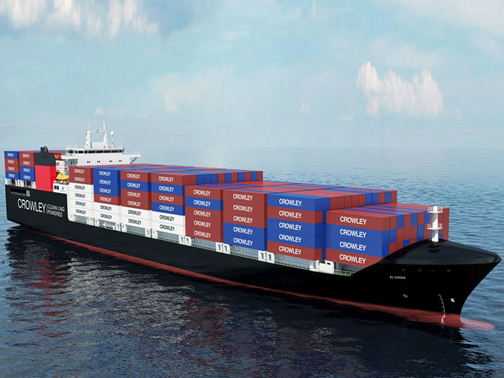 Crowley’s ships are designed to travel at speeds up to 22 knots while maximizing the carriage of 53-foot, 102-inch-wide containers. Cargo capacity will be approximately 2,400 TEUs (20-foot-equivalent-units), with additional space for nearly 400 vehicles in an enclosed Ro/Ro garage, the company said. Hey Buddy!, I found this information for you: "Crowley sets LNG engine in new maritime cargo ship". Here is the website link: https://newsismybusiness.com/crowley-sets-lng-engine-in-new-maritime-cargo-ship/. Thank you.